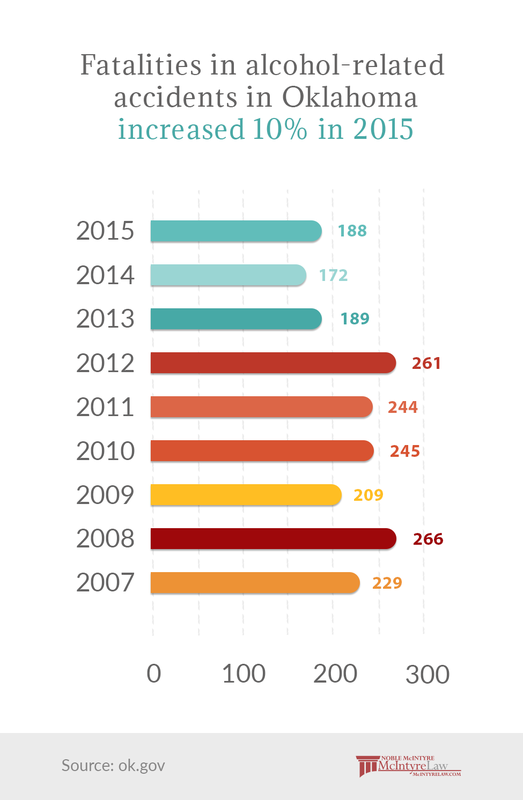 Oklahoma Drunk Driving Statistics: 2015 DUI Report - McIntyre Law P.C. Driving Under the Influence, or DUI, is a huge problem — and not just for Oklahoma. Drunk driving statistics show that the number of alcohol-related fatalities is increasing, and it’s everyone’s job to reverse that trend. 188 people died in drunk driving accidents in Oklahoma in 2015 — what if one of those people was your family member or friend? There are thousands of alcohol-related deaths on U.S. roads each year. The worst part? Drunk driving fatalities are completely preventable. Thousands of people would live to see another birthday if only someone hadn’t made a choice to drink and drive. While the one percent increase in the chart above might not seem like a lot, it’s equal to 16 people. Remember, this is looking only at drunk driving fatalities — it doesn’t reflect the number of actual alcohol-related accidents or injuries; it only shows the number of deaths. Overall, the number of deaths was lower in 2015 than it had been in the earlier part of the decade, with the exception of 2014. Perhaps that means that awareness is growing and people are being more careful, but the uptick in fatalities in the past year suggests that people could be becoming less vigilant. It will be interesting to see next year’s statistics to see if Oklahoma drunk driving fatalities continue to trend upward or if this year was an anomaly. Public perception suggests males are more likely to drink and drive than women, and drunk driving statistics show that’s accurate. However, women are the drivers in more than one quarter of alcohol-related crashes. Interestingly, that figure drops to 18 percent for the number of fatalities. Still, the message that driving drunk is a life-threatening choice is one that needs to be clear to both male and female drivers. Where are drunk driving accidents likely to happen? 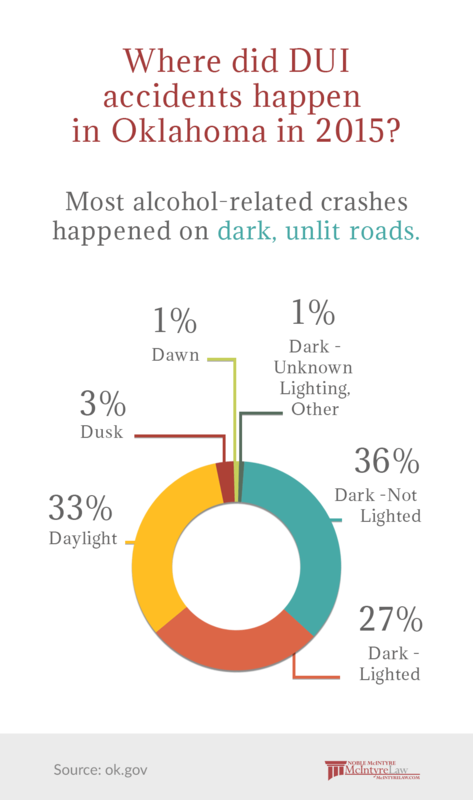 While Oklahoma drunk driving statistics indicate that the majority (at just over one-third) of alcohol-related crashes happen in dark, unlit conditions, 33 percent of these crashes happen in broad daylight. This statistic is followed by 27 percent in darkness, but lighted areas. The remaining few are at dawn, dusk or unknown light conditions. Looking at trends over a nine-year period is especially revealing when you break them down by county. The map below shows which Oklahoma counties have seen the most and fewest drunk driving fatalities. Tulsa and Oklahoma counties show the most, with over 200 fatalities each since 2007. What’s the safest county, according to our Oklahoma drunk driving statistics? That would have to be Harmon County, which hasn’t had a single fatality since since before 2007. If these numbers don’t scare you, they should. Why? Because in the past nine years, 1,950 drunk driving fatalities have occurred on Oklahoma roads. As a result of someone choosing to drink and drive, nearly 2,000 people are no longer with us. And, for every one of those 1,950 people, there are families and friends left behind who are still grieving. It’s our hope that you will never be one of those people, but we all need to act. Action, in this case, means looking out for yourself, your loved ones and your acquaintances. If you’re at a gathering and someone has been drinking, don’t let that person drive. Offer a ride home, offer to call a taxi, or consider a ride-sharing service like Uber or Lyft… offer something that will give that person another option. There’s always another option — driving drunk is never the right choice. If you’re a parent, teach your children early about the risks of drunk driving. Share this information about Oklahoma drunk driving fatalities; it’s not to scare them, but to educate them. And, know that there are resources. For more information, contact Mothers Against Drunk Driving (MADD) or Students Against Destructive Decisions (SADD) to find out how to do your part to prevent a tragedy. At McIntyre Law, our goal is to provide Oklahomans with the information that they need to be healthy and safe. But, if you find yourself the victim of a drunk driving accident, we can help. Contact us today for a free consultation. We advocate for victims of accidents that are the result of Oklahoma drunk driving. Fatalities are tragic — if one of your family members is a victim, we can help. No case is too big or too small, so call today.